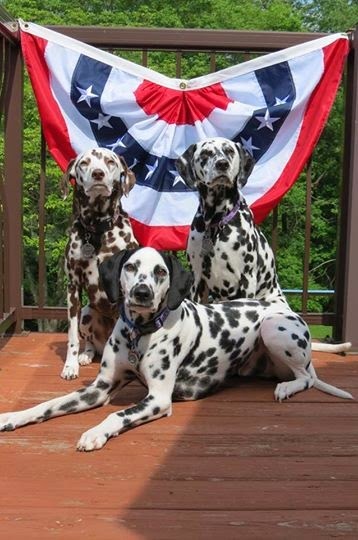 Tess, Jazz & Indy: Happy Memorial Day! The Adventures of Dalmatians Tess, Jazz & Indy...and Rocky, too! Help Us "Spot a Cure" for Breast Cancer! "The reward of owning a well-behaved, loving and intelligent dog is beyond measure. Those who have owned such a dog are truly blessed." Find more dog breeds here! "He is your friend, your partner, your defender, your dog. You are his life, his love, his leader. He will be yours, faithful and true, till the last beat of his heart. You owe it to him to be worthy of such devotion." If, by chance, you wish to remember me, do it with a kind deed or word to someone who needs you. If you do, I will live forever. Just a reminder - Unauthorized use and/or duplication of this material without express and written permission from this blog's author and/or owner is strictly prohibited. Excerpts and links may be used, provided that full and clear credit is given to Tess and Jazz Blog with appropriate and specific direction to the original content.